The residents of Symposium have voted to support religious tolerance throughout the world as our special community project. All religions teach peace and love. Visit Peace Seeds to read examples of the "Golden Rule" from different religions. This world is much too small for any of us to harbor hatred in our hearts. The violence experienced in the United States on September 11, 2001 is an example of the extent of misdirected hatred. The fighting between Israel and Palestine is another example of hatred that is out of control. There is much more . . . World leaders need to put their egos aside and work toward peace and a better life for all people. What can we do to promote religious tolerance in the world? We must begin this work at home. Every new friendship begins with something as simple as a smile. Pray (meditate) for all the world leaders according to your beliefs. Practice non-violence, promote tolerance of people who are different from you, and stop the hatred. Each person can make a difference. Please feel free to display this image on your website and it would be appreciated if you would link back to this page. If you would like this image with a different background or framed, please contact Muse Calliope and I will create it as time allows. If you would rather have a slightly different image to display, please visit Charity Images. If you wish to create your own images and share them, please send it to and I will add it with credit to you and a link back to your web site. All images must be from residents of Elysium Gates. I don't make the rules, I just follow them. Do you have a photo of you participating in your community helping Support Religious Tolerance and/or World Peace? Email it in and we will feature it and link it back to your web site! The current featured photo, comes from Girl Scout Troop 1058 of Boulder Creek, California. The girls are celebrating the Girls Scout & Girl Guide "Thinking Day." This event is every February 22nd. 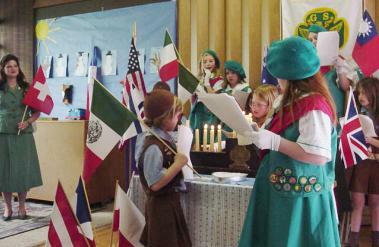 Girls Scouts/Guides around the world spend the month learning about different cultures and religions. Then on February 22nd, starting in New Zealand at dawn, they rise and have a special ceremony that sends prayers of peace and love to all other sister Girl Scouts/Guides around the world. Good job! Be sure to visit their site.